"Fake News" - Multiple Emmy Award winner Candice Bergen returns as the eponymous broadcast news legend in the revival of the groundbreaking comedy series MURPHY BROWN, which premieres Thursday, Sept. 27 (9:30-10:00 PM, ET/PT) on the CBS Television Network. 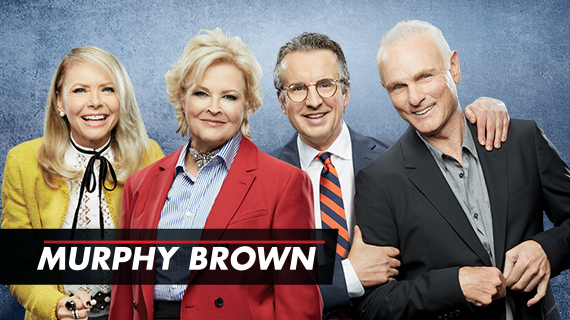 Back in the game after a brief retirement, and faced with a world of 24-hour cable, social media, "fake news" and a vastly different political climate, Murphy is determined to draw the line between good television and honest reporting, proving that the world needs Murphy Brown now more than ever. Thirty years since the critically acclaimed, multiple award-winning show premiered, and 20 years since it concluded, this revival reunites Bergen, also an executive producer, with multiple Emmy Award-winning series creator/executive producer Diane English and original series co-stars Faith Ford, Joe Regalbuto and Grant Shaud. Jake McDorman, Nik Dodani and multiple Emmy Award winner Tyne Daly also star. Amid a divided nation, chaotic national discourse and rampant attacks on the press, Murphy decides to return to the airwaves with her biting take on current events on the CNC cable network's morning news program, "Murphy in the Morning," for which she recruits her "FYI" team: lifestyle reporter Corky Sherwood, investigative journalist Frank Fontana, and her former wunderkind news producer Miles Silverberg. Joining them is social media director Pat Patel, who is tasked with bringing Murphy and the team into the 21st century. Murphy's millennial son, Avery, shares his mother's competitive spirit and quick wit and is following in her journalistic footsteps with his own new show as the liberal voice on the competing, conservative-leaning Wolf Network. The team still lets off steam at Phil's Bar, now run by his sister, Phyllis. During the show's original 10-year run on CBS, MURPHY BROWN received 62 Emmy nominations (with 18 wins), 15 Golden Globe nominations (with three wins), three Screen Actors Guild awards, five Directors Guild nominations (with two wins) and four Writers Guild nominations (with two wins). Bergen won five Emmy Awards and two Golden Globe Awards, and English won three Emmy Awards and two WGA Awards for Outstanding Writing in a Comedy Series. Last edited by dex14; 09-27-18 at 08:29 AM. I'm intrigued to watch this again. Will it just be relentless attacks on Trump and his staff though? I loathe the man with the fire of a thousand burning nuns, but I don't if a sitcom can survive on that alone. They've made it pretty clear what you're going to be getting (it's Diane English's bully pulpit) and that's why I'm not going to bother with it. Murphy Gray more like it!! aHaHahaHaHAHHaHa etc. There is not enough soft focus in the world to make me watch this. I saw an interview saying there are some shots here and there, but it’s not the main focus episode after episode. I never watched the original series and I don't plan to watch this either but I knew one of the folks that worked on the set for a long time so one day he came by and asked if I wanted a tour of the set (this was in the early 90's). I worked at the studio at that time already so took the 5 minute walk over there and he gave me the grand tour. Not having watched the show or anything the set tour didn't really mean anything to me and I'd been on lots of sets before but it's always interesting. Anyhow, when we were done, he told me to leave through that exit door right there and he'd see me later. So I open the door and there's a bunch of bright lights but he shoves me forward and closes the door so I'm stuck. So there I am on some newsroom set with Candice Bergen and a bunch of other people in the middle of a scene and it's happening like right exactly where I am. So I hear someone yell "Cut! Who the hell is that?!!" and they all turn and look at me with a look of shock and disgust that I ruined everything! So I think I remember stuttering "Uh I was told uh.. ummm" and then they all just started laughing. Turns it out was just during rehearsals and I was totally set up. Good times..
^ That is an amazing story! Reminds me of a story my buddy told me who was an extra in the movie Gone Baby Gone. Morgan Freeman played a prank on him and he was frozen and kinda freaking out until Morgan came over and apologized for it. I love stuff like that when people have fun on set. I probably watched over half of the original series - mostly missed the last few seasons... so I had to check this out. The overacting is pretty tough to take in sitcoms, and this had plenty of it. The actress that plays Corky was especially bad. The way they provided exposition was so unnatural. The characters are explaining to each other what happened to them over the years as if they weren't aware of that information already - just to update the audience. They may as well have just turned to the camera and told the audience directly - it would've been no less natural. Suspected we'd have a nod to Aretha - and there it was. No nod to Eldin. No mention of the Murphy's cancer returning in the finale, and that she beat it. I'll give it a couple more episodes before I decide to bail. Last edited by Coral; 09-28-18 at 10:19 PM. The overacting is pretty tough to take in sitcoms, and this had plenty of it. The actress you plays Corky was especially bad. There was a nod to Eldin. Murphy and Avery were sitting on the couch having a drink. They looked up at a mural on the ceiling and toasted him. Also, I thought this episode was filmed before Aretha died. So assume this nod was Murphy being a fan (?). But more special now since Franklin passed away. I agree with everything else you said. While I enjoyed seeing everyone again, the writing was really bad. Hope that improves. And I agree with all of the reviews I have read, the best scenes were between Murphy and Avery. The writing and acting didn't feel so forced. It wasn’t great, but hit the nostalgia buttons so we’ll probably keep watching. There was a nod to Eldin. Murphy and Avery were sitting on the couch having a drink. They looked up at a mural on the ceiling and toasted him. Somehow I missed that part of the scene, didn't see them drinking coffee or Murphy laying down with an icepack on her head - it's like my recording jumped to a spot 1 minute after that. I went back to check. Really weird. Isn't it a little too late for this? SNL, Daily Show, Samantha Bee, and other countless shows have taken the torch for spewing Trump and no new ground being covered with Murphy Brown. Murphy Brown returned to TV after 20 years off the air only to rank as CBS’ lowest-rated Thursday night comedy. The newsroom sitcom starring Candice Bergen premiered to considerably softer numbers than similarly hyped yesteryear sitcom revivals in recent seasons — such as NBC’s Will & Grace and ABC’s Roseanne. The heavily buzzed 9:30 p.m. premiere (which included a surprise Hillary Clinton cameo) was watched by 7.4 million viewers and had a 1.1 rating among adults 18-49 — the softest of the network’s two-hour comedy block. Murphy Brown fell 15 percent from its Mom lead in. A Seinfeldrevival would go down like crazy even though they’re all old men now. I do wonder how they would swing a Friends revival, though. Presumably they’ve all moved on with their lives, and aren’t still going to be going on bad dates and all of that other twentysomething stuff from the 90s. That would never happen. Jerry is done. However, I agree that it would get serious ratings. Well Joey moved to LA for his terrible spin off. Monica and Chandler's twins would be 14 by now and didn't they move to the suburbs. It really wouldn't work IMHO. I met Joe Regalbuto back when the show was hot. He came to town on a promotional tour for CBS along with some soap stars. I had just gotten my limousine service and scored the gig driving them. So he was the first star I got to meet. Nice guy. He told me had done community theater here in Rochester when he was just starting out. Although we enjoyed it the first time around I have little interest in seeing this. I guess I was assuming that it would just be a Trump dump in a crowded field of people doing nothing but taking shots at Trump. If it has legs and is more topical than political we may join in. Did anybody demand that this show come back? Yeah, my mom and dad. They’re in their 70’s. Last night's show was a huge improvement over last week. The scene with Murphy crashing Sarah Sanders press conference was just classic.